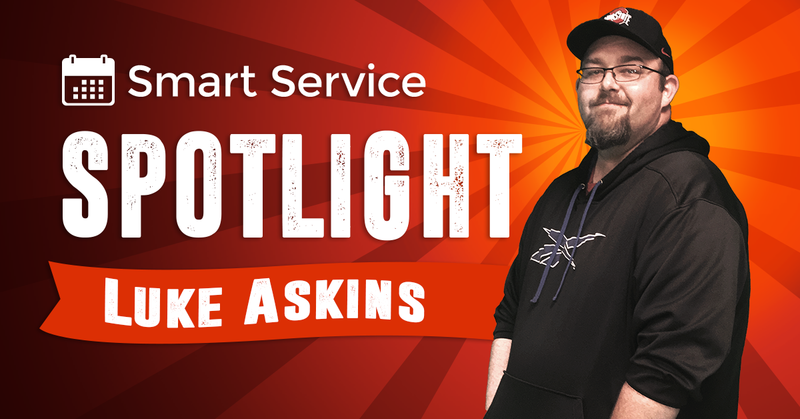 Meet Luke Askins, Smart Service Help Desk Manager! Your home for the latest field service news, business tips, and more. He's a former concert junkie and current father, husband, and gamer. He's also our Help Desk Manager! What is your role at My Service Depot? My role is the Help Desk Manager. I oversee all of the Help Desk and all of the trainers. Among various other types of office administrative duties, but the main goal is call volume, updates, testing, and all that fun stuff. What is your favorite part about this job? Hands down the people. Customers and employees alike would be by far my favorite part of the job. It’s always different every day! Too many. Way too many. My wife, Sam, works at a vet clinic and since she started there the animals have tripled. I have three cats and a dog. Started out with my cat Zazzles, then we got Ziggy, then Zippy. Someone found Zippy wandering in the Walmart parking lot in Delaware, brought him to the clinic, and then we got him. And we had to bring Zinc home. He kept eating through the bags that had food at Sam’s clinic and we just had to bring him home. If you could have lunch with any person (dead or alive) who would it be? My grandpa would be one. Then Jim Parsons. Then Keanu Reeves, but I’d only talk about The Matrix and Speed. What do you do to relax? Video games and hanging out with my daughter, London. Sometimes both. She’s nine and loves to stream on Twitch. Zero views, but she just thinks it’s so cool to hear her own voice played back to her. She actually has a job here! Unofficially. But she is our Chief Attitude Officer. Very important. Unfortunately I am one of the plainest and pickiest eaters. I would have to say Giordano’s plain cheese pizza. Mountain Dew, every day of the week. What did you want to be growing up? Physical therapist. In eighth grade I broke both my arms at the same time while playing football and I ended up having to go through physical therapy. And that was really cool to me. What’s the most exciting thing going on in your life right now? It’s a secret, but I’m going to a Taylor Swift concert in July with my wife and daughter. London doesn’t know yet, but this will be our second one. She’s going to be a concert junkie like me. How many concerts would you say you’ve been to? Hundreds. Probably close to three or four hundred concerts. What are you listening to these days? Marshmello. I just found out about him two weeks ago through the Fortnite tournament and thought “Hey this guy looks really cool I wonder what he does” and now I’ve downloaded everything he has. It’s happy music. I like it. Do you have a favorite app? Well the app I use the most is the Apple TV remote because my cat knocked ours into a bowl of water. But Hole.io is an app I play a lot too. Great game. Takes two minutes to play and it’s a pretty great time killer. I would like to learn how to be extroverted instead of introverted. Out in public I just clam up, it’s not a comfortable place for me. At work it’s different, it’s professional. I’ve been here for ten years, I’ve watched almost everyone working here get hired and trained. It’s home. Did you enjoy reading this article? Share it with your friends and co-workers! The recently-launched Smart Service Scholarship intends to help start young men and women on a careers path in a skilled trade or field service occupation. Smart Service joins the International Door Association! The leading garage door software and garage door association team up! Here’s what we loved at WWETT Show 2018! Visit the Smart Service booth at the 2018 WWETT Show! Visit booth 6266 at the 2018 WWETT Show this February 22-24 in Indianapolis! What’s New in Smart Service? Since the beginning of the year, we've stuck to a quarterly release schedule for new content updates to Smart Service and iFleet. With several major updates published (and many more planned), we felt it was time to start cataloging all the additions. The results of our efforts? The brand new Updates page! © 2019 My Service Depot, all rights reserved. Smart Service® is designed for use with QuickBooks® Pro, Premier, Enterprise, and Online software only. Intuit and QuickBooks are trademarks and service marks of Intuit Inc., registered in the United States and other countries. Apple, iPad, iPhone, and iPod touch are trademarks of Apple Inc., registered in the U.S. and other countries.